An all-new 2017 Chrysler Pacifica comes off the final production line at FCA's Windsor, Ontario, assembly plant. Fiat Chrysler said its Windsor assembly plant will be operational Monday, Nov. 14, after a parts shortage idled production there for a week. “Windsor Assembly Plant is back to regular production next week, starting with the regulation shifts Monday, Nov. 14,” FCA Canada spokeswoman Lou Ann Gosselin said today. A Unifor spokesman said the union will start notifying members through traditional and social media that work will resume Monday. Unifor, the union that represents roughly 6,000 workers at the plant, said on Nov. 3 the plant would be idled due to a shortage. There was no regular production Nov. 7-10 and the plant was already slated by contract to be idle on Nov. 11 so employees could observe Remembrance Day in Canada. 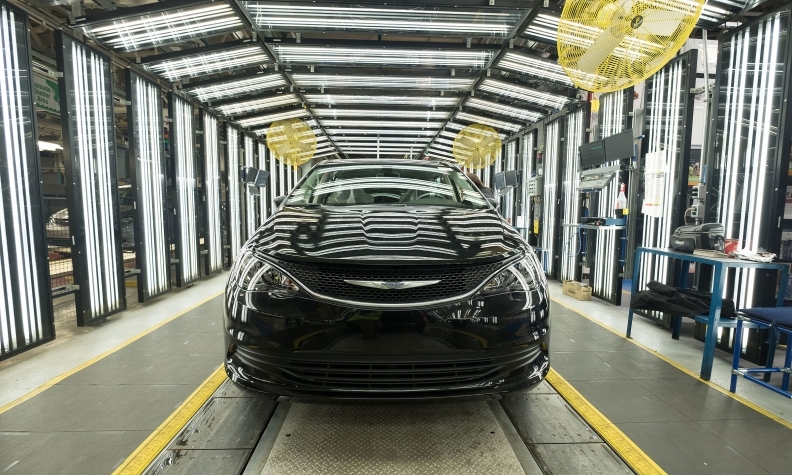 FCA’s Windsor assembly plant runs three shifts per day, building about 1,500 Dodge Grand Caravan and Chrysler Pacifica minivans each day. It was never made clear by FCA whether the suspension of minivan output was related to a large fire that destroyed a Magneti Marelli warehouse in Tennessee on Nov. 1. Magneti Marelli, a subsidiary of Fiat Chrysler Automobiles, is a major lighting component supplier to FCA and other automakers.